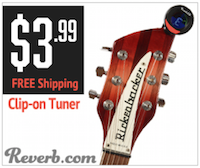 It's an automatic guitar tuner that connects to your smartphone using Bluetooth and tunes your guitar automatically. 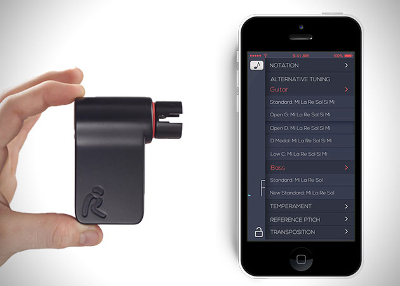 Roadie is a brand new gadget that promises to take the work out of tuning your guitar. It consists of a motor, a Bluetooth chip, and a tiny computer that hooks up wirelessly with an app on your smartphone and turns a tuning peg according to the instructions from the app. You place the gadget over a machine head, play the string – with the app open on your phone – and the app 'listens' using the phone's microphone and detects the pitch of the string. It them compares that with what it should be (determined by the tuning you've chosen) and tells the motor to turn the peg so that the tuning is correct. If you're tuning an electric guitar, Roadie can connect to it directly using an adaptor that ships with it and plugs into the guitar's cable jack. You can also use it with other stringed instruments with machine heads, like banjos, mandolins and ukulele's. It's a neat idea that's a cross between the chromatic tuning apps which are ten a penny these days, and the automatic tuning systems found on some Gibson and Epiphone guitars. We haven't tested Roadie, so we can't vouch for its accuracy, but its maker says it's three times more accurate than the human ear. The app has all the common tunings already built-in but you can create your own custom tunings too, which is useful if, say, you prefer to play sharp or flat. Roadie is also supposed to be able to keep track of the elasticity of your strings and tell you when you need to change them. When you're ready to swap the strings for a new set, it will unwind the machine heads for you. The video below has a few more details and shows Roadie in action. What do you think? Are automatic tuners like this the future? Would you worry that the motor might develop a fault and overwind the strings? Do you just prefer to rely on your ears with perhaps a little help from a chromatic tuner? Tell us in the comments below. There's more information about pricing and availability on the Roadie website.